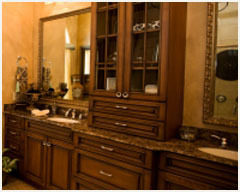 We are a full-service cabinetry company that handles the entire process from concept and design through to flawless installation. It begins with customer’s vision for the space. Clients are matched with a cabinet designer who will ensure the finished product is more than just appealing to the eye. Computer generated designs give the client accurate insights to how the cabinets will look and function. Cabinetry Design strives to create solutions that are functional, economical and best-suited to the needs of the people who use them every day. A solid design is the best start, but transforming an idea from paper to product takes skills, experience and patience. It also requires a steadfast commitment to creating on “top drawer” quality products. 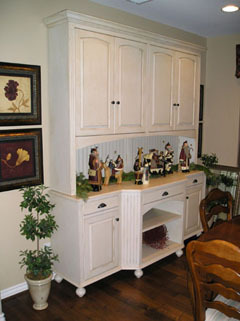 In fact, the craftsmanship of every Cabinetry Design project is second to none. Our team believes that success hinges on their dedication to excellence. In the finishing process, our goal is to accentuate the natural beauty of the wood. We hand-rub our stains and can enhance the finished results with glazes, antiquing and distressing. Our cabinets are sealed inside and out with the best conversion varnish ensuring an unparalleled depth of finish. Now that the Cabinetry Design craftsmen have designed and built the best cabinet solution, the final measure of this creative process comes during installation. Cabinetry Design guarantees quality and professionalism in this crucial stage of the project. Each installation team knows the project specifications and will arrive promptly and install the finished product with precision and care. 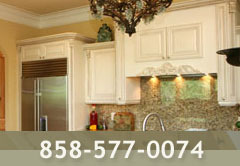 Because all cabinetry is finished in our factory, there are no paint fumes or mess in your home.